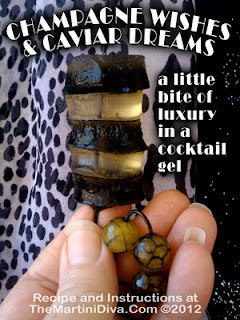 July 18th is NATIONAL CAVIAR DAY and I couldn't let it pass without giving you a fun way to have caviar in your booze. I got so riled up that I actually came up with a Caviar Martini AND Edible Caviar Jello Shots. We may not be living in the greed driven, decadent 1980's and we may not be awash in a life of luxury but there's no reason why we can't grab a little bit of gourmet for one martini or a glitzy edible bite at happy hour, right? Garnish: 2 small slices of a cucumber. 1 caviar cube. Add the cucumber slices and vermouth to a cocktail shaker and muddle to release juices from cucumber. Fill shaker with ice, add vodka and shake until chilled. Double strain into a chilled cocktail glass garnish and serve. 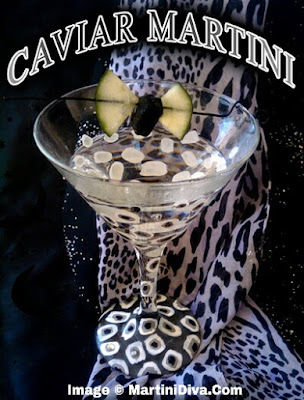 Get the full size, mailable Caviar Martini Recipe Postcard/Invitation HERE.